A large cloud named Cygnus X-3 and a smaller cloud, nicknamed the "Little Friend," both appear in white. Jets of gas emitted from "Little Friend" from star formation are shown in blue and red. The life cycle of stars comes full circle in a new photo taken by NASA's Chandra X-ray Observatory and the Smithsonian's Submillimeter Array (SMA), which may reveal new clues for studying star evolution. The photo captures a large cloud called Cygnus X-3 and another smaller cloud, nicknamed the "Little Friend." Cygnus X-3 contains a massive, short-lived star that is slowly being eaten by a companion black hole or neutron star and, as a result, produces bright, powerful X-rays. The Little Friend, on the other hand, is a dense cloud of gas and dust that gives birth to new stars called a Bok globule. You can take a video tour of the "Little Friend" here. "We nicknamed this object the 'Little Friend' because it is a faint source of X-rays next to a very bright source that showed similar X-ray variations," Michael McCollough, an astronomer from the Harvard-Smithsonian Center for Astrophysics (CfA) in Cambridge, Massachusetts, and lead author of the study, said in the statement. The faint X-rays radiating from the Little Friend were first spotted in 2003, using Chandra's high-resolution X-ray telescope. In 2013, astronomers later found the Little Friend had a mass between two and 24 times that of the sun, and deduced that it was likely a nursery for infant stars (a Bok globule). Using the Submillimeter Array — a series of eight radio dishes atop Mauna Kea in Hawaii — astronomers detected molecules of carbon monoxide, confirming the Little Friend was, in fact, a Bok globule. A jet or outflow was also found within the Little Friend, indicating a star has started to form inside. "This discovery provides a new way to study how stars form," officials said in the statement. "Typically, astronomers study Bok globules by looking at the visible light they block or the radio emission they produce," Lia Corrales, a study co-author from the Massachusetts Institute of Technology, said in the statement. "With the Little Friend, we can examine this interstellar cocoon in a new way using X-rays — the first time we have ever been able to do this with a Bok globule." What's more, the Little Friend is located approximately 20,000 light-years from Earth, making it the most distant Bok globule ever recorded, NASA officials said. The X-ray binary Cygnus X-3, where a massive star is slowly being eaten by a companion black hole or neutron star, is blasting X-rays toward us and toward the nearby stellar nursery called "Little Friend," which then reflects the rays back to us. 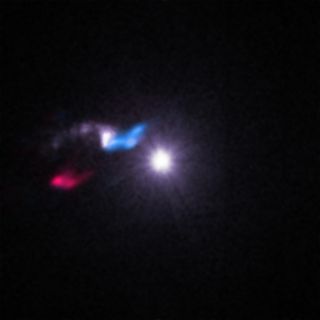 Jets of gas (whose carbon monoxide here is shown in red and blue) indicate star formation within Little Friend. The close proximity of the two stellar bodies provides astronomers with a unique opportunity to measure how far away Cygnus X-3 is from Earth. "Since the early 1970s, astronomers have observed a regular 4.8-hour variation in the X-rays from Cygnus X-3," officials said in the statement. "The Little Friend, acting as an X-ray mirror, shows the same variation, but slightly delayed because the path the reflected X-rays take is longer than a straight line from Cygnus X-3 to Earth." Based on the delay time between Cygnus X-3 and the Little Friend, astronomers estimate Cygnus X-3 is about 24,000 light-years from Earth, according to the study, published in The Astrophysical Journal Letters. That distance puts Cygnus X-3 outside the Milky Way's four spiral arms, which is particularly surprising, the astronomers said. Cygnus X-3 contains a massive, short-lived star and therefore likely "originated in a region of the Galaxy where stars are still likely to be forming," NASA officials said in the statement. However, "these regions are only found in the Milky Way's spiral arms," which means Cygnus was relocated (at speeds between 400,000 and 2 million miles per hour), following the supernova explosion that formed its companion black hole or neutron star. "In some ways it's a surprise that we find Cygnus X-3 where we do," Michael Dunham, an astronomer from the CfA and co-author of the study, said in the statement. "We realized something rather unusual needed to happen during its early years to send it on a wild ride."